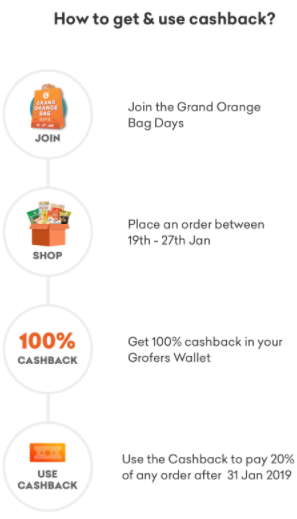 Get 100% Guaranteed cashback up to Rs 5000 from Grofers during Grand Orange Bags Day Sale (19-27 Jan). 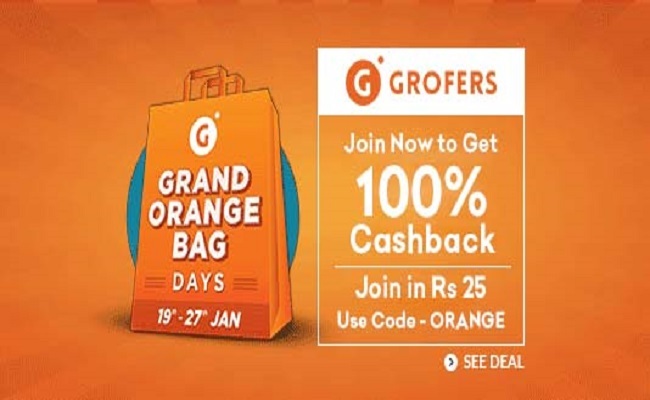 Get 100% Cashback upto Rs.5000, just sign up for Grofers Grand Orange Bag Days sale by paying Rs.25(REFUNDABLE DURING SALE) before 18th Midnight and shop for anything between 19th to 27th January and get 100% Cashback on Grofers!!! 1. Visit this link and register for the Grofer Grand Orange Bag Days. 2. Scroll down to use code ‘ORANGE’ and click on APPLY to get Rs.25 off on Rs.50 Registration fee which is REFUNDABLE during the Grand Orange Bag Days Sale! 3. Pay via Pay Paytm to get Rs.10 Cashback or via Airtel Payments Bank to get Rs.25 Cashback on this Rs.25 Registration fee. 4. 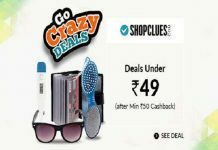 Shop on Grofers between 19th to 27th of January and get 100% Grofers Cashback during the Grofers Grand Orange Days Sale. 5. 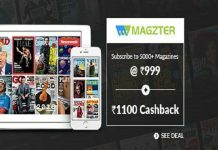 20% of this cashback earned during the sale can be used in your future orders on Grofers. 6. Don’t wait, register as soon as possible, ONLY TWO DAYS LEFT for registration. 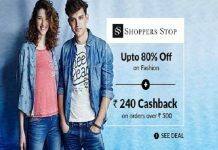 The offer is valid for new and existing users in Grofers delivery areas of Delhi NCR, Jaipur, Kanpur, Lucknow, Ahmedabad, Mumbai, Pune, Hyderabad, Bengaluru, Chennai and Kolkata. 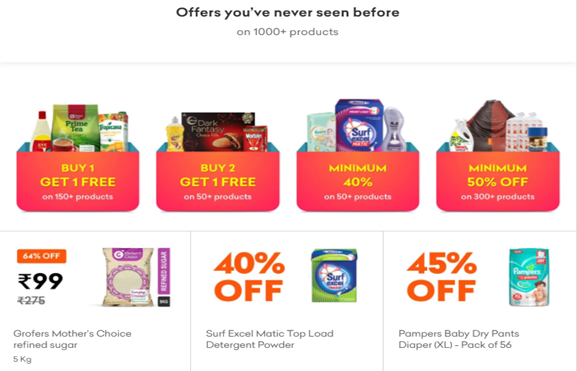 Grofers is also rolling out additional benefits such as ‘Deals at Re 1’, ‘Buy 1 Get 1 Free’, and ‘Minimum 50% off’.